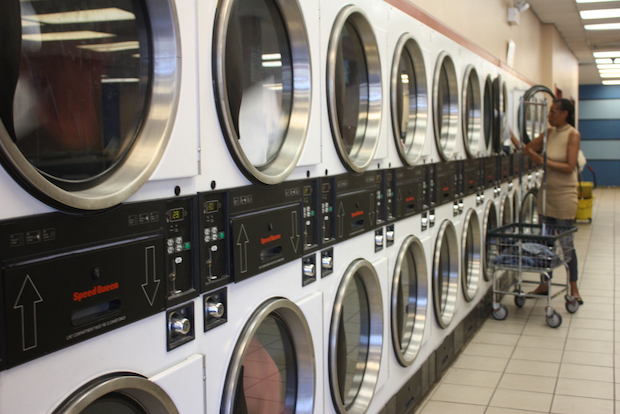 ENGLEWOOD — Jason Sowell believes there is power in providing people with a few quarters and free detergent. "For some of them, to choose between buying groceries and washing their clothes is quite literally a choice," Sowell said. "That should be something that they should not have to choose." A resident of Tampa, Florida, Sowell is partnering with Chicago Ideas Week to bring the Laundry Project initiative to Chicago. From 10 a.m.-1 p.m. Saturday, anyone needing a load washed may bring it to Wash & Relax Laundry, 1153 W. 69th St., for a free wash-and-dry. Cleaning clothes may be taken for granted by many, but Sowell said the idea behind his initiative is about providing a basic need. "When giving back, people often focus on food and shelter, which are definitely important," Sowell said. "But there is a specific overlooked need there — needing clean laundry. There's dignity in having a clean set of clothes or clean sheets to sleep in." Dre James, a 26-year-old who has worked at the laundromat for seven years, said Saturday's event will be a help to those in the area. "It's a good thing to give back to our community," James said. "No one comes from outside of Englewood to help it, so this means a lot." Sowell's organization held 47 events around the country in 2013, mostly focused in the Tampa Bay area. But it also traveled to Austin, Texas, Canton, Ohio, and Las Vegas, Nevada. About 10,000 free loads of laundry were done in that year. Sowell expects the Englewood stop will result in 250 to 300 fresh-smelling loads, slightly higher than the average. The Laundry Project never asks laundromats to cut their prices, and funds usually are raised through small donations, Sowell said. These events don't cost much either, averaging $700 each, he said. Sowell said he expects this to be the first of many such events in the city. "It's not that much. It's quarters and detergent," said Jessica Malkin, executive director of Chicago Ideas Week, which has done other service projects in Englewood, including at Harper High School. "Shockingly, people don't realize how small of a gesture you can make. It could have a ripple effect in an entire community. If you didn't have access to [a free washer and dryer], you would probably be very interested in this," Malkin said. With washes costing $2.50 to $8 per load — dries being free already — several people at Wash & Relax Thursday afternoon said they wished they had known about Saturday's event. Though none interviewed said they ever faced the choice of buying food or washing their clothes, they said they were aware of people in the neighborhood who could use the free wash-and-dry. "Every quarter could help," said Mallorie Wilborn, 28, as she pulled two loads out of dryers. "Some people can't afford it. I see it all the time."